While I was still living in Scotland, I had a good choice of various oatcakes to go with cheese. However, my favourite was a small oatcake from the selection of Marks & Spencer that was speckled with coarsely ground black pepper. They used to sell them in the little M&S outlet at the Waverley train station, and I often bought a box to nibble on my commute from Edinburgh to Stirling (I did a 9-month post-doc at the University there during my last year in Scotland). And that's the kind of oatcake I wanted to serve with our selection of British cheese. After some searching, I came across just the thing. You'll find the original recipe in Hugh Fearnley-Whittingstall's River Cottage Every Day (look for Bill's Rona oatcakes, or see the recipe in The Guardian), here's a very slightly tweaked version that we loved and that I'll keep. Preheat the oven to 180 C/350 F and line a large baking tray with parchment paper. Mix all the dry ingredients in a bowl, make a well in the centre. Pour the oil into the well, then pour in enough boiling water to bind it into a firm, not sticky, dough. Work quickly. Don't worry if you over-water a bit - you can remedy the situation by adding more oatmeal. Form the dough mixture into a ball and leave it to rest for 15-30 minutes. Dust your worktop with some extra oatmeal, and roll out the dough to about 5 mm or 1/5th of an inch thick. Cut out discs with a cookie cutter (I used a 5 cm one). Place the oatcakes onto the baking sheet and bake for 15 minutes, then turn and bake for a further 5 to 10 minutes. Cool on a rack. Store in an airtight container and serve with your favourite Cheddar. Great recipe and great point. Cheddar takes on a new meaning with the oatcake! Interesting! I love cheese and I love oats! 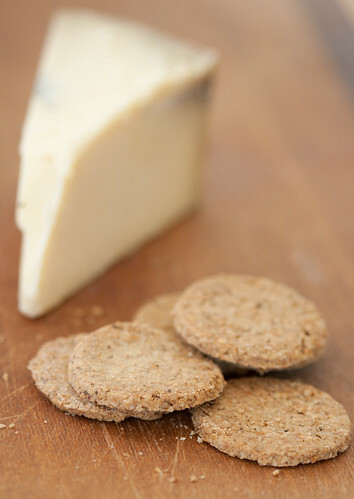 I made oatcrackers a couple of weeks ago (http://kardemums.blogspot.com/2011/10/havreprinsessor-pa-hostpromenad.html), but they are a little too sweet for cheese I think.